The U.S. says Vladimir Putin was responsible for the downing of an MV-22 Osprey military aircraft yesterday off the coast of Okinawa. 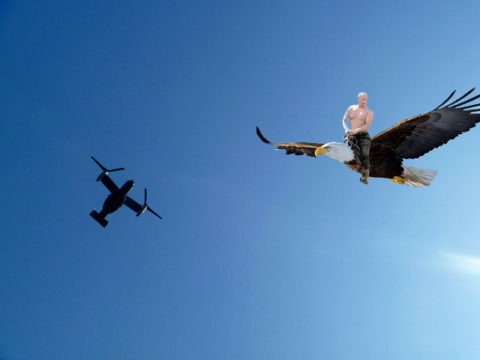 Pentagon spokesman Captain Jeff Davis says Putin was spotted near the Osprey riding on the back of a large bald eagle without a shirt. “To be honest, it was a magnificent sight to behold,” Davis told reporters. According to the Pentagon, Putin and his eagle assumed the attack position from a high altitude before executing a triple somersault dive maneuver and a knockout blow square to the nose of the MV-22 Osprey. American journalists attending today’s bilateral discussions between the Russian President and Prime Minister Shinzo Abe are reporting evidence of minor lacerations on Putin’s right hand across four of his knuckles.